New York-based playwright Martyna Majok, whose 2018 Pulitzer Prize-winning drama Cost of Living is currently receiving its West Coast premiere at the Fountain Theatre, will interact with local audiences and theater professionals at two special events. On Saturday, Nov. 10, following the 8 p.m. performance of Cost of Living, Majok will lead a Q&A discussion with the audience. On Monday, Nov. 12, at 5 p.m., Majok will host an “insider meeting” for theater professionals as well as general “theater lovers,” during which she will discuss playwriting and the business of working in theater. An Insiders Meeting with Martyna Majok is free and open to the public on a first come, first served basis. Reservations are necessary and can be made here. Participants who wish to stay after the event may purchase Pay-What-You-Want tickets to that evening’s performance of Cost of Living at 8 p.m.
Achingly human and surprisingly funny, Cost of Living is about the forces that bring people together and the realities of facing the world with physical disabilities. It premiered at the Williamstown Theatre Festival, then transferred off-Broadway in a Manhattan Theatre Club production at City Center. 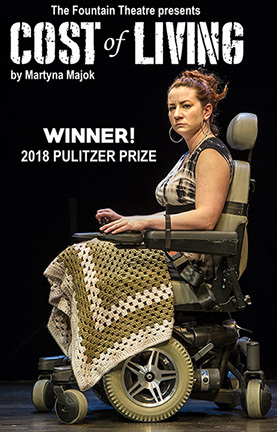 In addition to the Pulitzer, the play garnered the Edgerton New Play Prize; the Jean Kennedy Smith Prize, John F. Kennedy Center; the Women’s Invitational Prize, Ashland New Play Festival; the Lucille Lortel Award for Outstanding New Play; and was named one of the “Best Plays of 2017” by The New York Times. Cost of Living performances continue at the Fountain Theatre through Dec. 16.